Yunguba, which lies directly underneath the Brisbane's Storey Bridge on Kangaroo Point. It was built in 1877 as an immigrant hostel. It is one of the very few publicly owned open spaces. Nearly all the surrounding land in Kangaroo Point, including the neighbouring land formerly owned by Evans Deakin shipyards, has been turned into a concrete jungle of high rise residences. Whilst hopes to save the historic Yungaba migrant hostel have been dashed by Minister for Infrastructure and Planning Paul Lucas's decision to use extraordinary powers to 'call in' the development application for Yungaba. Nevertheless, the Yungaba Action Group believes that the responsible politicians, including those now standing for re-election, should be held to account for their defiance of community wishes. The Immigrants’ Memorial Association is having a virtual inaugural meeting on Sunday 19th October from 2pm-4pm Brisbane Time. The Immigrants' memorial association is currently fighting to save the historic Yungaba hostel from being turned into a private gated community by the Singapore-based Australand property development company. 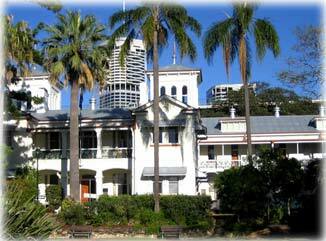 The Queensland Government has threatened to fine the owners of the heritage listed "Keating House" $75,000 for allowing it to fall into disrepair, yet when large parts of historic Yungaba House, the responsibility of the Queensland Government itself, have been condemned as unsafe due to its own negligience, the problem was 'solved' by selling it off to a Singapore-based developer to be turned into a gated community, against heated community objections. What you can do: attend Virtual Inaugural meeting of Immigrants' Memorial Association to be held 19 Oct 08. What has been done: Protest at Community Cabinet at 12:45PM on Sunday 14 Sep at Belmont State School, Old Cleveland Road, Carindale to protest Minister Paul Lucas's decision to disallow the appeal. Last week BCC posted the long-anticipated negotiated development approval on their website - it will see the guts ripped out of Yungaba, the last remaining intact 19th century immigration depot left in Australia, leaving only a shell for the public to view from outside a gated community. Yungaba Action Group needs your help to launch a legal fight against the development approval - no amount is too small to give!